It seems there's always been an imagined separation between a me, here, and Life, everywhere else. Sometimes it's more pronounced than others, but in conversations with friends and family, it's pretty clear that I'm not alone in this feeling. There are two roads this imagined separation have taken. Sometimes it appears as feelings of loneliness, inadequacy, or isolation. On the other hand, a sense of being special, privileged, or important can often also result. Is either true? Are either of these paths actual or real, or are they simply an imagined state of affairs? Has this feeling of being a separate self been brought on by belief in the stories I've been told since childhood? Is there real or tangible physical evidence to support this belief? Examining these questions is the intent of this doodle and inquiry. The method I will use for this inquiry, as mentioned, is to look at the truth of reality as plainly as possible, without the overlay of thought. I'm looking for direct evidence rather than anything learned from parents, teachers, friends, or society. As the Buddha suggests, the idea is to Be a Lamp Unto Myself, and to take no one's word on anything at all. The truth of how life presents itself will be determined by the senses. I'm going to do NOTHING more than what's asked. And I will examine this for direct evidence only, using the simplest of tools, those given to each of us. If it's true that this is something a child can see or understand, then I will need to use a child's mind to do this. Here goes! 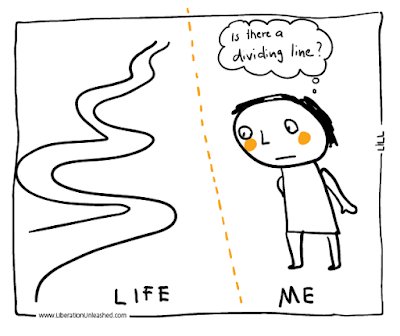 "Is there a dividing line?" I'm Looking. Right now there is a computer screen and keyboard, a living room with furniture, a television, and walls beyond. My husband is sitting next to me. When looking, there is no line, no demarcation, no division between what feels like it's "Right Here", and what feels like it's "Over There". When looking out at the view, I cannot find the place or line where I end and everything else begins, though there is still a felt sense of the existence of a division. Where does this felt sense come from? There is absolutely no evidence of it. It seems that the sense of division comes from a very old belief that there is a me here and that this Me exists inside a body. Funny. I can't see this inside of the body. As a matter of fact, I can't even see the whole body to figure out where the inside actually is. The parts of the body which I can see are not separated from the view of the room, or even the computer. There are hands on a keyboard, but there is nothing on or in those hands which say, "mine". If I'm relying on visual evidence only, they could be anyone's. There does seem to be a correlation between a feeling of fingers on a keyboard, and the visual of typing, but those experience do not, in and of themselves, mean that there is actual separation. The separation seems to be happening only within thought and "feelings" which go along with the thought. The feelings are sort of vague and I can't really define or pinpoint them. I've noticed that language confuses the issue. At every turn, it reinforces the idea of an "I" here. "I'm looking." "My husband is sitting next to me." These thoughts keeping looping back to the idea of separation even when the evidence very clearly shows that it's not at all how life is actually appearing. It seems important to note that language is part of the structure which confuses and reinforces an idea rather than direct evidence of reality. If what is plainly seen with the senses is truer than what thought imagines, then can the idea of being special, separate, lonely, or isolated actually be true? Can they be any more than just ideas? And since ideas change so often and radically, is there any reason to lend them any importance at all? What if the feeling of separateness is just an idea with no substance? From the results of this inquiry, it certainly seems that way. Where does your division or demarcation appear? Is it hanging in the air between you and life, or is it a line on the ground which you aren't allowed to cross? 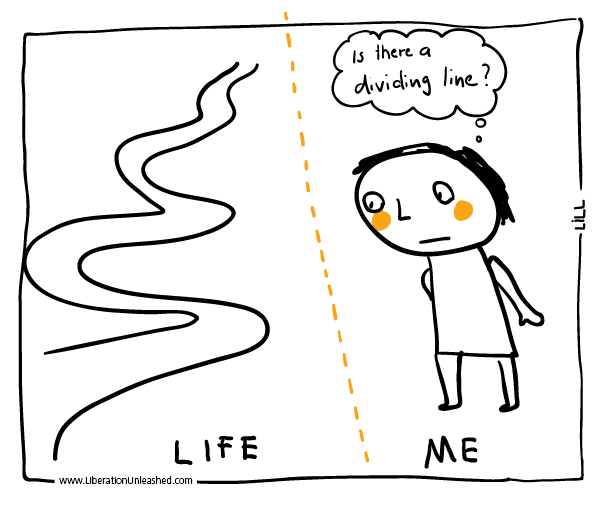 Exactly what does it divide? Look at the view right now. Can a boundary or dividing line be seen anywhere in the view? Is there a median or separation? Check and re-check for the thing that stands between You and Life itself. Can anything at all be found?